For the receptive visitor, spectacular geological formations offer a serene grandeur that can quiet the buzzing anxieties of the human condition. Most are products of imperceptible tectonic forces such as the uplift of mountains pressing upward inch by inch, or the creeping forces of erosion, employing wind, sand, ice and rain to sculpt primordial rock into canyons, bulwarks and towers. However, some of the most dramatic are geological blitzkrieg events, the release of sudden monstrous energies from volcanoes, earthquakes, and impacts, leaving immense scars on the Earth. Extraterrestrial objects streaking out of the heavens adds mystery to the mayhem. They burst forth from a stately cosmic order, as random as a drive-by shooting, obliterating the quotidian processes of earthly geology. The Chicxulub Crater on the Yucatan Peninsula is the most devastating impact site currently known on Earth. Blasting a crater 180-240 kilometers in diameter, its arrival 66 million years ago matches precisely with the extinction of the dinosaurs at the K-Pg boundary (formerly K-T, changed as a gag by bored paleontologists) ending the Cretaceous. The list of destruction released by the strike includes mega-tsunamis, immense fires, global greenhouse warming, global cooling from aerosols and dust, volcanoes, and acid rain. The cataclysmic object is generally considered to be a type of asteroid; however, some scientists argue that the evidence supports an extremely fast moving comet plowing into the Earth. With minor magnification or even the unaided eye, a bright full moon offers a veritable dartboard of craters. Here on Earth, the Barringer crater is the closest thing to visiting the moon. While many craters erode away in wet climates, the largely dry Arizona plateau combined with a recent vintage of a mere 50,000 years has left the crater relatively pristine. Composed of iron-nickel, the meteorite that blasted out the crater is estimated to have been about 50 meters in diameter and 300,000 tons in mass. On impact, the explosion and fireball released the energy of a hydrogen bomb. 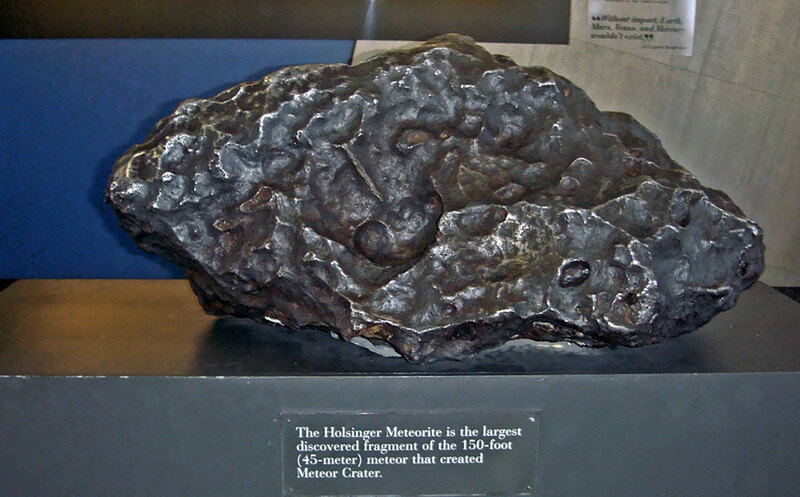 Pieces have been recovered up to 15 kilometers away, and the largest, known as the Holsinger Meteorite, is on display in the Barringer Crater Museum. During the 1960s Apollo astronauts used Northern Arizona as a training ground for the moon mission. An Apollo Test capsule is on display at the museum grounds. Because of its similarities to moon craters, the Barringer crater provided valuable information to the astronauts in their preparations for the moon landing. Today it is still offering important insights for future exploration of the solar system. 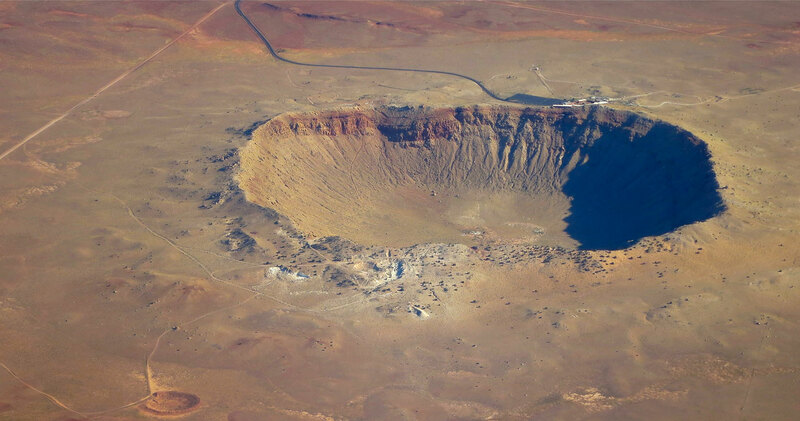 The crater is east of Flagstaff, just a few miles off of Interstate 40, at the end of a paved road. It is easily accessible to anyone interested in astronomy, geology, and the sort of cosmic dice roll that might wipe out New York or even terminate much of life on Earth. It’s that macabre element of cosmic billiard balls careening about that attracts the attention of devotees of ‘dark tourism’, which dedicates an informative webpage to describing the Barringer Museum grounds. 50,000 years ago, a giant fireball streaked across the North American sky. At its core was a meteorite – a chunk of nickel iron about 150 feet (50 meters) wide. The meteorite weighed 300,000 tons and traveled at a speed of 26,000 miles per hour (12 kilometers per second). When it struck the earth in what is now northern Arizona, it exploded with the force of 2 ½ million tons of TNT, or about 150 times the force of the atomic bomb that destroyed Hiroshima. Most of the meteorite was melted by the force of the impact, and spread across the landscape in a very fine, nearly atomized mist of molten metal. Millions of tons of limestone and sandstone were blasted out of the crater, covering the ground for a mile in every direction with a blanket of shattered, pulverized and partially melted rock mixed with fragments of meteoritic iron. When the dust settled, what remained was a crater three-quarters of a mile (about 1 kilometer) wide and 750 feet deep. The impact occurred during the last ice age, a time when the Arizona landscape was cooler and wetter than it is today. The plain around it was covered with a forest, where mammoths, mastodons and giant ground sloths grazed. The force of the impact would have leveled the forest for miles around, hurling the mammoths across the plain and killing or severely injuring any animals unfortunate enough to be nearby. Over time, the landscape recovered. A lake formed in the bottom of the crater, and sediments accumulated until the bowl was only 550 feet deep. Then, with the ending of the ice age, the climate changed and dried. The desert that we see today has helped to preserve the crater, by limiting the erosion that might otherwise have blurred or erased the traces of the ancient impact. In the early 1900s, the mining engineer Daniel Barringer became the first proponent of the thesis that the crater resulted from an extraterrestrial impact. Most geologists, including the prominent G. K. Gilbert, insisted it was volcanic in origin. In 1908, Barringer was supported by the geologist George Merrill. However, the theory remained controversial. Barringer believed that an immense core of iron from the meteorite remained buried under the crater, and he hoped to mine it for profits. In this he was mistaken, and died bankrupt from repeated efforts to dig shafts into the crater floor. In 1928 astronomer F.R. Moulton demonstrated that any meteorite would have vaporized on impact, leaving no gigantic mass behind. Most recently I visited the Barringer Crater on a mild mid November day in 2015. There is a trail along the rim of the crater but visitors are required to be accompanied by a guide. The trail was temporarily closed due to the appearance of a baby rattlesnake, which was out basking in the sun. 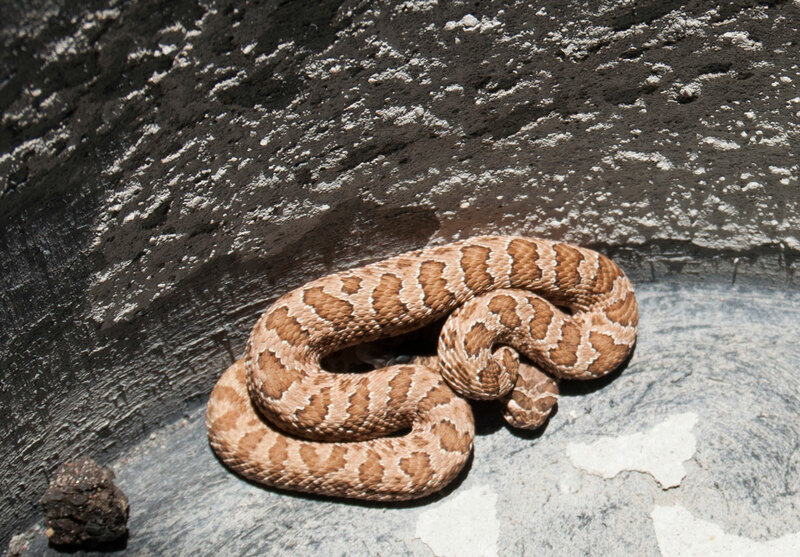 As the risk from a baby rattler is minimal, unless you step on it in thongs or barefoot — or pick it up –this seemed rather timid. Personally, I wanted to rush out on the trail as quickly as possible to see the rattlesnake before it slithered into the rocks. After a staff member dropped it into a bucket for relocation, the guide officially reopened the trail and took us out on the rim for a short tour. As the snake was being carted away, I had a chance to snap a photo. Seeing the little Hopi Rattlesnake, Crotalus viridis nuntius, reminded me of the passing of my German friend Ludwig Trutnau earlier in the summer of 2015 at the age of 80. Ludwig was a herpetologist and author who traveled around the world conducting research on snakes, lizards, and crocodilians. He had visited me several times in Arizona on his forays out searching for various species of rattlesnakes and other reptiles. Generally, he was hoping to photograph specimens in their native habitat or to learn new details of their range and behavior. Ludwig would have been thrilled to encounter the baby rattlesnake; undoubtedly, he would have tried to badger them into releasing it on an attractive rock so he could get a photograph au naturel. 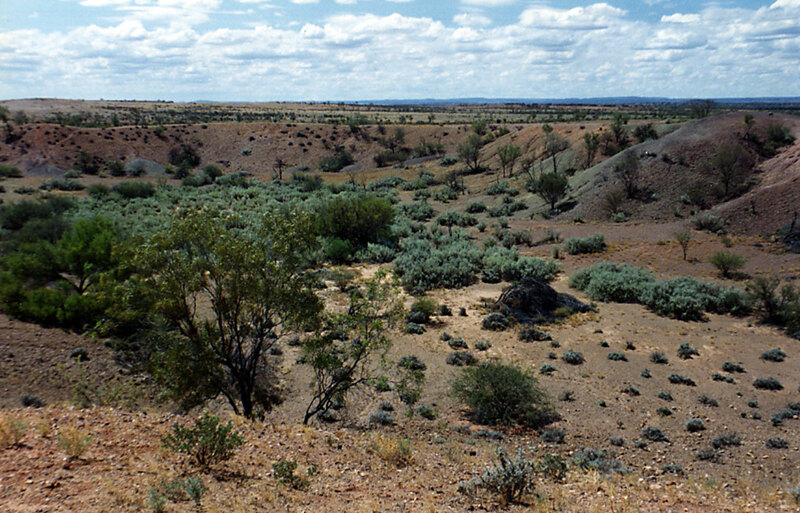 Two of the sites that I hope to visit on a future trip to Australia are the Wolfe Creek Crater, dating to 300,000 years before present, and the ancient Gosses Bluff Crater, dated to 142 million years. While visiting Halls Creek, WA many years ago, I tried to drive the 90 odd miles of dirt road out to the Wolfe Creek Crater in my rental car. Unfortunately, heavy rains had washed out areas of the road and I reluctantly turned around before I got mired down in mud or wrecked the car. The site now draws quite a few tourists, partly due to an Australian horror film associated with the area. Although not a fan of horror films, maybe the influx of tourists will add impetus to improving the road. Surprisingly, some of the remnants of meteorite strikes may capture snapshots of ancient ecosystems. Glass beads, produced from molten material driven into the atmosphere where it cools, can capture organic material in the air without the heat destroying it. Kieran Howard and Chris Jeynes demonstrated that this material can be recovered from the beads, providing samples of ancient life. On one of my several trips driving between Alice Springs and Uluru, I took a side jaunt to the Henbury Meteorites Conservation Reserve. Relatively young at only 4,700 years old, the site consists of a cluster of a dozen craters resulting from the breakup of a large nickel-iron meteorite before it struck the ground. 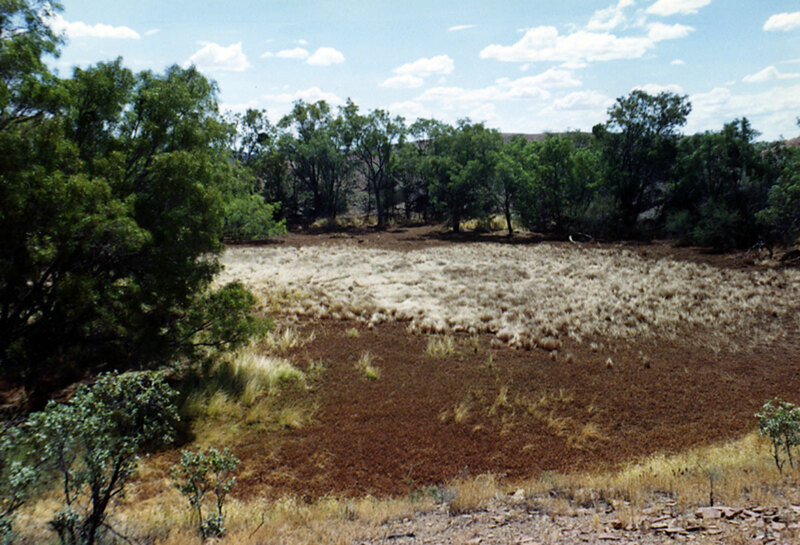 While the Barringer impact, at 50,000 years, was not witnessed by humans, the Henbury impacts were undoubtedly observed by Australian Aborigines living in the region. Although the area is sparsely populated, people may have been killed by the tremendous explosion and fireball produced by the immense release of energy on impact. It would have been a stunning event for anyone who witnessed the explosion, and a challenge to make sense of it. “When scientists first visited Henbury in 1931, they brought with them an Aboriginal guide. When they ventured near the site, the guide would go no further. He said his people were forbidden from going near the craters, as that was where the fire-devil ran down from the sun and set the land ablaze, killing people and forming the giant holes. They were also forbidden from collecting water that pooled in the craters, as they feared the fire-devil would fill them with a piece of iron. Hamacher and his colleague John Goldsmith have co-written a fascinating paper examining the Aboriginal perspectives on a number of meteorite sites across Australia. Without that catastrophe of the Chicxulub impact, would the age of the giant reptiles have ever ended? Would large mammals and a strange lineage of apes, hominids, have ever appeared? Not an experiment easy to repeat. In our future, will some giant cosmic marble come whooshing in at 40,000 miles per hour and replay the great Cretaceous extinctions? The grim irony is that cosmic marbles may be superfluous. Humans seem intent on reenacting massive extinctions across the planet in mindless pursuit of growth and profits. Terracide or a nuclear war, perhaps triggered by conflict on a dying planet, might terminate the human epoch. Stay tuned. Once humans are just a grainy smudge on the cosmic highway, it might be the age of a new order of creatures, the age of the Devil Dogs. And maybe Chicxulub missed a few of the dinosaurs as well. Just off I40 on the Hopi plateau there are still some strange creatures out there, lurking. Devil dogs and dinosaurs. Aborinines, asteroid, Australia, Barringer, chicxulub, devil dog, dinosaurs, Flagstaff, Henbury, Hopi, Hopi rattlesnake, impact crater, Ludwig Trutnau, meteor, meteorite, meteroid, Randy Graham, wolf crater, wolfe crater. Bookmark.